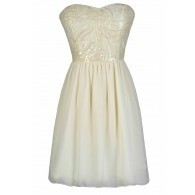 Lovely and ladylike best describes this feminine dress with a simple and flattering fit and flare cut. 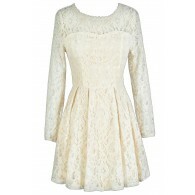 The Crochet Lace Collar Pleated Dress features a rounded crochet lace collar that attaches to the top of this dress. 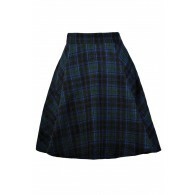 The attached skirt has oversized pleats throughout, creating a flirty, flouncy shape. An invisible side zipper completes this lovely look. The Crochet Lace Collar Pleated Dress would be perfect paired with black pumps and a clutch for a feminine, put-together look. You have added Crochet Lace Collar Pleated Dress in Black into Wishlist. You have added Crochet Lace Collar Pleated Dress in Black for Stock Notification. You have set Crochet Lace Collar Pleated Dress in Black as a loved product. You have removed Crochet Lace Collar Pleated Dress in Black as a loved product.